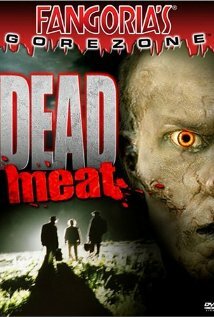 On the Zombie World Tour last night I finally saw that Irish film, Dead Meat. It was really interesting, with some very strong nods to Night of the Living Dead and Texas Chainsaw Massacre (these were the most obvious) with a sort of Blair Witch city-people-afraid-of-the-country vibe and a subtle Plants vs Zombies gag. The zombies are created from not only Mad Cow Disease, but mad cows. Staggering cows and hazmat-suited workers is a scary image that even works over here, and I suspect had even more impact over there. I think zombie fiction is always stronger when the creation event is somewhat believable and this disease has been used effectively before in the Joe Ledger novel Patient Zero. I think there might have been social commentary but I never figured out what it was. The film was very gory, and had the blackest humor I’ve seen in a very long time. There were a couple of truly inspired zombie kills, at the same time gory, inspired and suffused with that very black humor (and possibly social commentary). In keeping with my Gulf Stream Theory, the zombies moved at about a 3Romero speed, and they used tools. Each character in the film is a distinct, broadly drawn stereotype, or I assume they are. My favorites are the hurling coach and his wife, who I mistook for a zombie when she was introduced. I think the social commentary might have been something about women, if we look at the way the Final Girl, Helena, makes a few kills. There’s a great setup of her being absolutely clueless, entering an apparently abandoned cottage in the middle of nowhere after running from a deadly resurrection scene that killed her fiancé. She passes a bloody curtain, then she passes a gore drenched pickaxe, then she walks over bloody floor and under a gory ceiling and stares at a bloody old lady with a dripping crucifix dangling from her hand. Red everywhere. Then she’s SURPRISED when she’s attacked. Just as my eyes started to roll she actually began to fight back, eventually dispatching the zombie fiancé with a well-placed vacuum cleaner to the eye socket. Never seen that before. Later, she takes off the high heels she’s been hoofing it through the countryside in and ninja-throws it into a zombie head. Told you they were inspired.